NDA Syllabus PDF:- Hello Friends, Today We have discussing about UPSC NDA Syllabus 2019 for NDA 1st Exam & 2nd Exam also. The National Defence Academy (NDA) Entrance Exam conducted by the Union Public Service Commission (UPSC) for enrolling the candidates in the Indian Defence forces in which Indian Army, Indian Navy ad Indian Air Force included. The NDA (National Defence Academy) exam is conduct twice in a year. In which 1st exam is conduct on 21st April and other 2nd exam will be conducted on 17th Nov. Now they can check here the UPSC NDA 1st Exam Pattern also. UPSC Conducts National Defence Academy (NDA) Exams which Includes interviews Covering General Aptitude, Psychological Testing, Team-Building Skills Along With Physical And Social Skills And Medical Tests. It’s not that Easy At All. 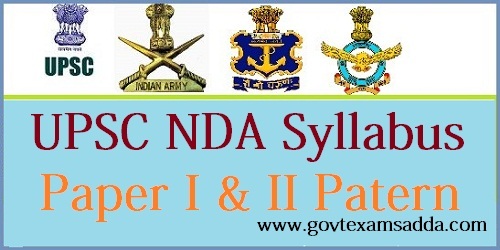 So here we have provide complete UPSC NDA Syllabus 2019 about the Paper Pattern and the Syllabus For National Defence Academy (NDA) 2019. We have advised to candidates that they must revise or repeat all the tough topics which is coming in the UPSC NDA Exam 2019. We have also provided the UPSC NDA Exam Paper Pattern in details. Before start NDA Exam Preparation, it is very important to check personally with the overall syllabus from where the questions will be raised. The NDA Exam pattern comprises of Mathematics subject and General Ability. Below we have mentioned the detailed UPSC NDA Syllabus. Here on this article, we have providing you the Complete UPSC NDA Syllabus 2019. It is very significant and mandatory to bring with you the overall NDA Exam Syllabus from where the questions will be raised. In the NDA Exam Syllabus includes the Mathematics, General Ability Chemistry, Physics, General Knowledge, General Awareness, English, History, Geography and Current Events also included. Below we have given the complete NDA Syllabus information which is very important for all the candidates all over the India. In the National Defence Academy Paper 1 & Paper 2 Exam consist papers two. The first paper is Mathematics & 2nd one is General Ability. 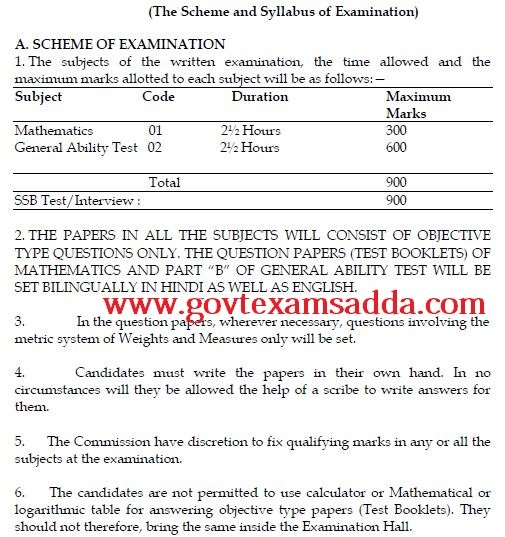 Mathematics:- The paper 1 contains 300 marks objective type questions based on 10th , 11th & 12th standard. There will be negative marking for each wrong answer. General Ability:- In this Paper there will be 2 Parts, The 1st section is English with 200 Marks & the 2nd Paper will be General Knowledge Consist 400 Marks questions. There will be 120 question in the Paper 1 & 150 questions for Paper 2. For SSB Interview is 900 Marks also. Application of Derivatives in Problems of Maximum and Minimum. Simple Chemical Equations Law Of Chemical Combination (Excluding Problems). Properties Of Air And Water. Preparation And Properties Of Hydrogen, Oxygen, Nitrogen, Carbon Dioxide, Oxidation, And Reduction. Material Used In The Preparation Of Substances Like Soap Glass Ink Paper Cement Paints Safety Matches And Gun-Powder. Elementary Ideas About The Structure Of Atom Atomic Equivalent And Molecular Weights Valency. Forces Shaping The Modern World; Renaissance, Exploration, And Discovery; War Of American Independence. French Revolution, Industrial Revolution and Russian Revolution. Famous Personalities – Both Indian And International Including Those Connected With Cultural Activities And Sports. For the help of applicants, We have given above the UPSC NDA Syllabus 2019. Candidates who have submit their application form successfully, Now they can download the UPSC NDA Syllabus 2019 Paper 1st & Paper 2nd. If you have any query or suggestion they they can comment us.